God commanded Adam and Eve not to eat from a certain tree because disobedience would cause death on every level to invade the planet (Genesis 2:14, 15). They disobeyed and the curse came to steal, kill, and destroy. God reiterated this truth when He stated, “If you disobey Me, the curse will come on you.” (See Deuteronomy 28:15.) It was true with Adam, it was a fact during the days of Moses and Jesus, and it is true today. Obedience brings blessing, and disobedience opens the door to the curse. 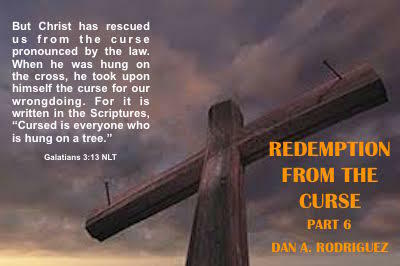 The only thing that can cancel that trajectory into the curse is repentance, confession of sin before the Lord, forgiveness, and cleansing from all unrighteousness (Luke 13:3; 1 John 1:8-10, 2:1), and then taking a stand on redemption from the curse (Gal. 3:13). People don’t understand that their choices in life have everything to do with whether they have life or death, or blessing or cursing. (See Deut. 30:15-20; Galatians 6:7, 8; Proverbs 18:20, 21; Romans 1:21-32; Gal. 5:19-23.) We will look further into the legalities of WHY people can either position themselves for blessing or for the curse. The sooner we learn these truths, the better we will lay hold on our redemption in Christ. We discuss these things and more in this podcast. I can’t begin to tell you how important this subject is for every single believer. Don’t miss this powerful teaching! Hey, please listen to the previous 5 messages or you will hear about the house without first pouring the foundation. Then, be one that sends this Word and blesses others. Forward to your family, friends, or acquaintances.